Aaron James Ramsey /ˈræmzi/ (born 26 December 1990) is a Welsh footballer. He plays as a midfielder for Arsenal and the Wales national football team. As of 17 May 2014. ↑ "Premier League Clubs submit Squad Lists" (PDF). The Football Association. 2 February 2012. Retrieved 12 February 2012. ↑ "Player Profile: Aaron Ramsey". Squawka. Retrieved 22 July 2014. ↑ "Player Profile: Aaron Ramsey". Premier League official site. Retrieved 22 July 2014. ↑ "Player Profile: Aaron Ramsey". Whoscored. Retrieved 22 July 2014. ↑ "Aaron Ramsey statistics". ESPN FC. Retrieved 2 December 2013. ↑ "Ramsey wins Wales Young Player award". Arsenal F.C. Retrieved 9 September 2013. ↑ "Ramsey wins Player of the Month award". Arsenal F.C. Retrieved 9 September 2013. ↑ "Ramsey is Arsenal Player of the Month". Arsenal F.C. Retrieved 9 September 2013. ↑ "Ramsey is Arsenal Player of the Month". Arsenal F.C. Retrieved 9 October 2013. ↑ "Ramsey is Arsenal Player of the Month". Arsenal F.C. Retrieved 7 November 2013. ↑ "Ramsey is Arsenal Player of the Month". Arsenal F.C. Retrieved 6 December 2013. ↑ "An award winning night at the London Legends Awards". Willow Foundation. Retrieved 6 March 2014. 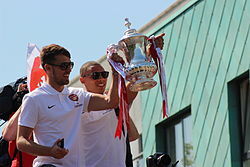 ↑ "Player of the Season - in first place..."
Wikimedia Commons has media related to Aaron Ramsey. Aaron Ramsey profile at Arsenal F.C. This page was last changed on 29 July 2014, at 21:49.